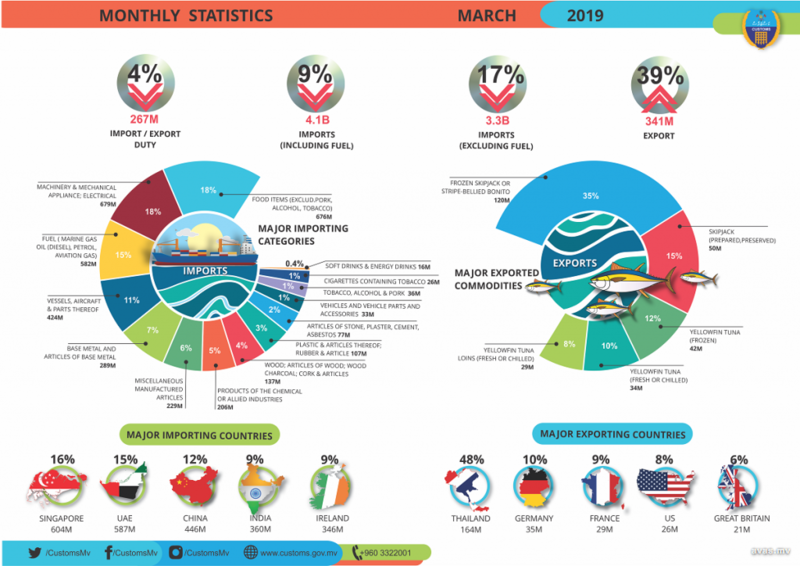 A 39% increase has been recorded in amount of goods exported from the Maldives in 2018. Statistics released by Maldives Customs Service show that goods worth MVR 246 million were exported during March 2018 whereas goods worth MVR 341 million were exported during the same period this year. While goods worth MVR 4.5 billion were imported last month, this is a decrease of 9% from the amount of goods exported last year which was worth MVR 4.1 billion. 16% of goods were imported from Singapore while 15% was imported from United Arabic Emirates and 12% from China. Ireland, a country that is usually not in the top five countries where goods are imported to Maldives from, was included in the list as an aircraft worth MVR 345 million was imported from the country.